St Philip’s College Year 7 student, Abeer Srivastava, won a gold medal for the top result in English in the Northern Territory and South Australia. He was born in Luchnow, the capital of the Indian state of Uttar Pradesh. Head of English at St Philips Pushpa Vida says Abeer won the award for reading and comprehension. The test consisted of nine text passages with 55 questions he had to analyse in one hour, requiring “initiative and insight” to arrive at the correct ones of the multiple choices. The medal sponsored by the University of NSW signifies he is in the top 1% of participants for a Year 7 student in the NT and SA. More than 980,000 entries were received but only 514 students from Australia were awarded medals for their outstanding achievement. The gold medal has also been won by past student Nina Miers and Year 12 student Stewart Thornton. 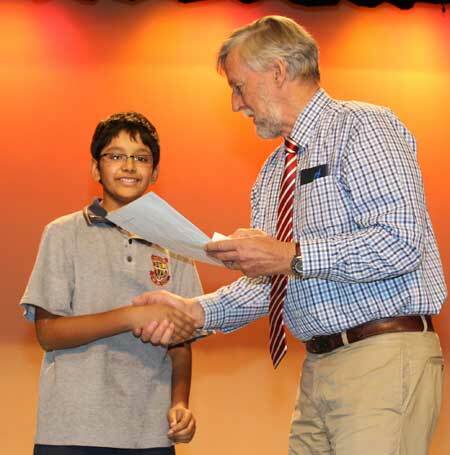 Abeer, aged 13, received a high distinction for every test he participated in. He is pictured receiving the medal from college headmaster Chris Tudor yesterday. Congratulations, Abeer, keep up the good work. St Philips and the staff are to be recommended for their great support to their students.